The Scottsdale Mint is one of the few private American mints producing bullion and proof coinage with the authorization of foreign governments. Among them are the Congo Silverback Gorilla coins. 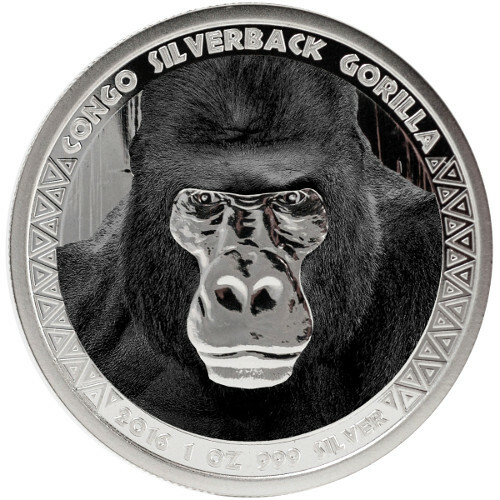 The 2016 1 oz Proof Silver Colorized Congo Silverback Gorilla Coin is available to you today online at Silver.com. Ships to you in a protective display box with Certificate of Authenticity. 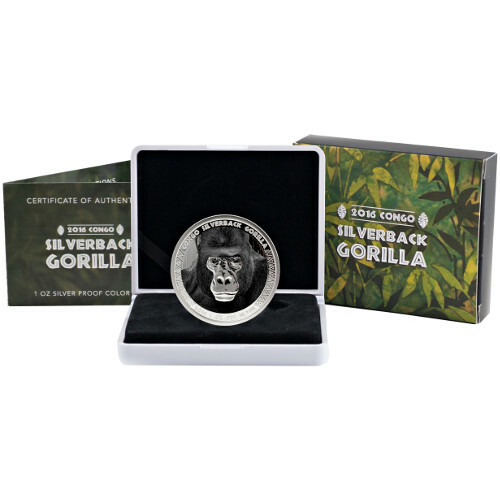 Second year of release for Congo Silverback Gorilla coins! Mintage limited to 2,500 coins only! Issued a face value of 5,000 Francs by the Republic of Congo. Obverse features the colorized, imposing image of the gorilla. Reverse includes the coat of arms. Silverback is a term used to refer to the alpha male in a gorilla family group. Gorillas naturally inhabit tropical and subtropical forests throughout various stretches of the African continent. Interestingly enough, gorillas have a wider elevational range, living from 7,200 ft up to 14,100 ft, compared to their spread across the continent. The recognized taxonomy of the gorilla includes the western gorilla and eastern gorilla species, with western lowland and Cross River gorillas in the former category and mountain gorillas and eastern lowland gorillas in the other. The obverse of the Proof Silver Colorized Congo Silverback Gorilla coin features the 2016 exclusive design for the coin series, a close-up view of a male silverback’s face with the addition of black coloring to his fur. 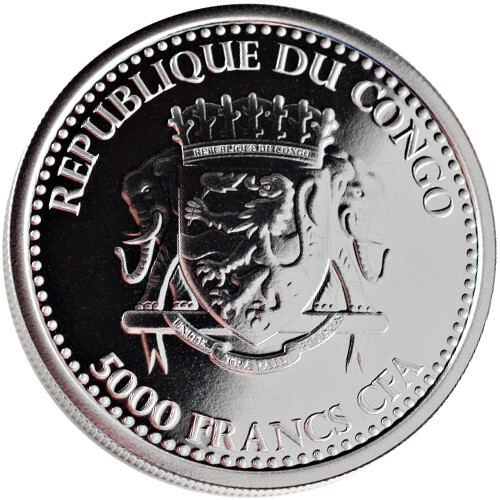 On the reverse is the coat of arms for the Republic of Congo. Engravings on this face include the face value and nation of issue, with the latter engraved in the native French tongue of the nation. Each of these 2016 1 oz Proof Silver Colorized Congo Silverback Gorilla Coins features the dark, black colors of a male silverbacks face. It is a subtle addition to this coin, but one that adds value to the proof striking. The Scottsdale Mint is a private minting facility located in the Phoenix, Arizona suburb of Scottsdale. This is the mint’s first sovereign coin program. A significant portion of silver bullion used by Scottsdale in its production process is recovered from other industries, such as manufacturing. We encourage all Silver.com customers to contact us with questions. You can reach our customer service team on the phone at 888-989-7223, connect with us online through our live chat, or simply send us an email. For a full listing of silver for sale through Silver.com, simply visit our website.